What is a Dhurrie Rug? With so many rugs on the market these days, there are a lot for discerning buyers to choose from. These include everything from flatweave rugs to long and short pile rugs. With new style rugs to antique versions available, there is always a rug available to suit every budget and home décor design. Join the team at Woods Rug Laundry as we discuss the Dhurrie Rug. The dhurrie rug was traditionally used in India as a floor covering. However, the concept of a dhurrie is a little different than a traditional rug, as a dhurrie was also used for bedding or packaging, not only for flooring. The use of a dhurrie can depend on the size, pattern and material. Some are small enough to be used as table covers and others are large enough for social gatherings. Colour combinations and patterns also cater to the needs of different tastes and occasions. What is a Dhurrie Rug Made From? Dhurrie rugs are commonly made from four types of materials – cotton, wool, jute and silk. The material is converted into thread and then woven into shape. They are made manually by skilled artisans on traditional horizontal or vertical looms. The flat, no-pile weave is the distinctive feature of the dhurrie rug. The tight weave makes the rug durable and easy to clean. The warp or lengthwise portions of the dhurrie are not visible except at the fringed edges due to the horizontal loom weaving technique used. Traditional dhurrie rugs are commonly found in geometric and striped designs, as well as mosque or minaret designs. Modern designs incorporate florals, medallions, chevrons, and squares. When it comes to colour, traditional dhurrie rugs use natural fibre colours. Modern rugs, however, use more vivid colours. The biggest appeal of the dhurrie rug beside durability is its reversibility. Due to the weaving technique, both sides of the rug are patterned. This means the rug can be easily flipped for a fresh surface. The pattern is essentially the same with a little variation in colour. Dhurrie rugs don’t have built-in pads or backing making them easier to carry or shake out. What is the Difference Between a Dhurrie and a Pile Rug? 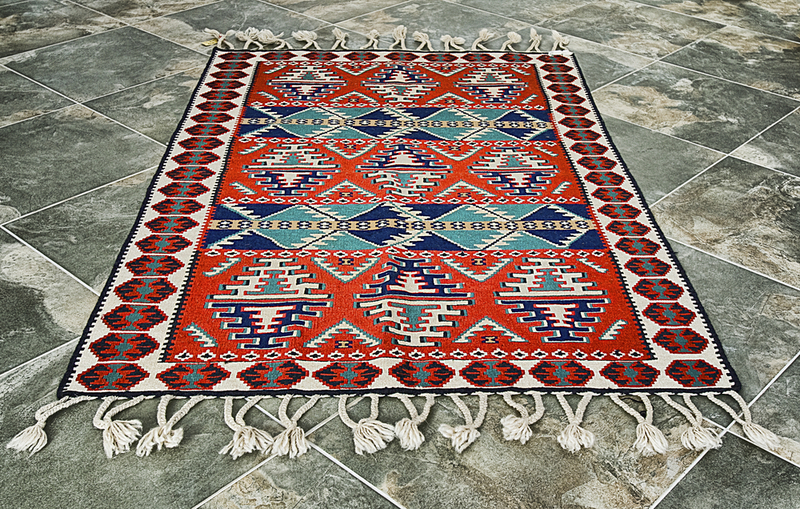 The biggest difference between a dhurrie rug and a pile rug is how they are woven. On a pile rug the designs are made by knotting individual short strands of different onto the warps and by pressing the wefts tightly. 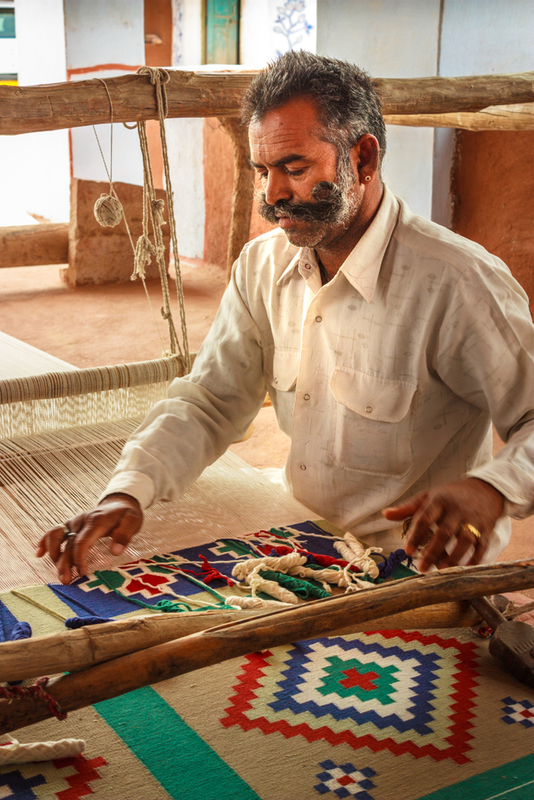 Dhurrie rugs are made by interweaving the variously coloured wefts and warps, creating what is known as “flatweave”. How Do You Clean a Dhurrie Rug? Dhurrie rugs are thick, flat woven rugs that are intended to protect the floor and add glamour to any household. As such, dhurries do not harbour as much dirt and dust as long pile rugs. However, because they lack a deep pile to hide dirt, it is essential to routinely clean them. Due to the delicate mix of materials and natural dyes, professional cleaning is essential for stains and spills to be carefully treated by professional rug cleaners. With off-the-shelf cleaners you run the risk of causing irreparable dye run damage and destroying the fibres. However there are small home cleaning measures you can do every day. Gentle sweeping should be done once a week on both sides of the rug to remove all dirt, dust and debris. A hand broom or a handheld brush is ideal as there is more control, making it less likely you will damage the delicate rug. Gently brush over the entire surface on each side, keeping the rug on a flat surface. You should also vacuum your dhurrie rug at least once a week with a handheld vacuum. A handheld vacuum is ideal as it is powerful enough to remove dirt and dust but is not powerful enough to tear at the fibres. If you don’t have the option of using a handheld vacuum, then ensure you use your vacuum on low suction only and never use a revolving brush. Just like sweeping, you should gently vacuum both sides of the rug. If your rug has a fringe, however, ensure you don’t vacuum the fringe as it may unravel. What is the Difference Between a Kilim and a Dhurrie? So, what is the difference between a kilim rug and a dhurrie rug? In reality, not much! Before the 1970s kilim rugs and dhurrie rugs were created in different regions however this is no longer the case. Aside from geographical differences, dhurrie and kilim rugs use very similar weaving techniques, are flat rugs, and are generally made from wool. 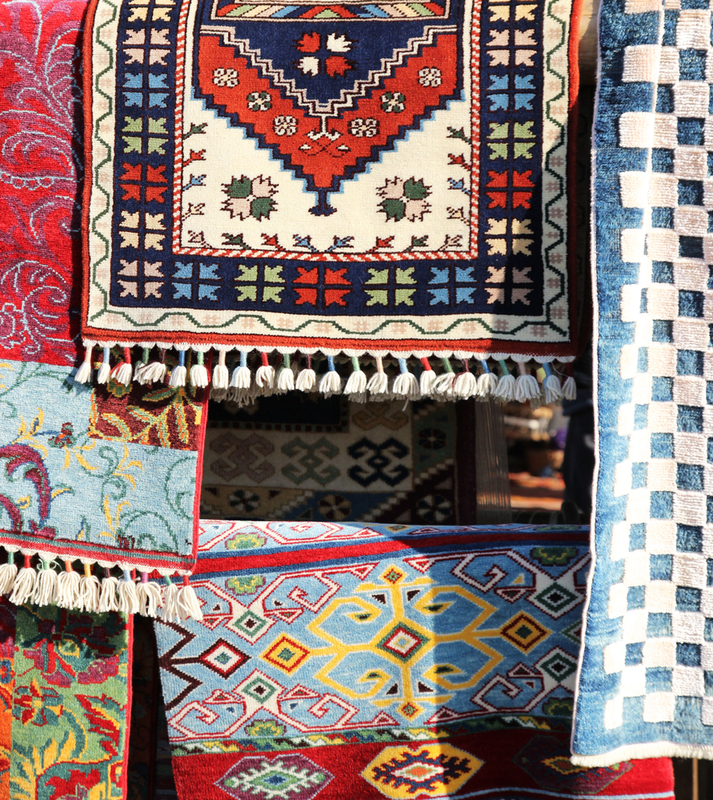 As such, many sellers and even rug cleaners use the term kilim and dhurrie interchangeably. Traditional dhurrie rugs tend toward more natural, pastel tones due to their use of natural dyes, with flowing stylised designs. Kilims, on the other hand, tended to have bolder geometric patterns. While those definitions are sometimes used to tell the difference between antique dhurrie and kilim rugs, modern rugs tend to use these designs interchangeably. Do you have a dhurrie rug that needs cleaning? Contact the team at Woods Rug Laundry today for more information on our professional rug cleaning services! What is a Kilim Rug? What is a Sisal Rug?